Buffer lands around Whatcom County refineries. 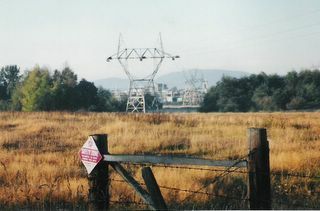 Power lines seen here are going into Alcoa Intalco Aluminum Works. Two oil refineries are also located in this area. Ironically, it's one of the best parts of the county to bike in. Not that many people live around the refineries so traffic sparse. One might view this as an argument that drilling for oil in the Alaska Wildlife Refuge may not be the end of the world. Pollution control and buffers around large oil facilities make them appear green. On the other hand, where people live and shop. That can appear totally hectic, paved over and polluted. Speaking of oil, the bicycle trip I took, last weekend to Skagit County, brought me to a Crispy Cream Doughnut factory. Had one doughnut for 89 cents. Peddling 60 miles, round trip, relieved the guilt, but the flavor of the doughnuts is over hyped. I guess it is doughnut "oil I can live with out." Now chocolate milk, that is a different story. I must be addicted to that, but I drink the low fat variety. That's the news from my personal "oil," or lack there of, economy.